This week I am just finishing up a nasty little cold that has swept through our house, so my big focus the next couple of days will be to catch up on the day-to-day stuff: laundry, dishes and the like. Those things always seem to fall by the wayside when I am under the weather! Nordic skiing season has finished so the captain’s banquet is this weekend and it is the last full week of dress rehearsals before the middle school play opens next week. Fun! The weather in my area is still unseasonably warm, feeling more like the beginning of April than mid-February. I am itching to get out in the garden and play in the dirt, but I just know the minute I do, we will have a big snow storm! Has the weather been crazy in your area this winter? 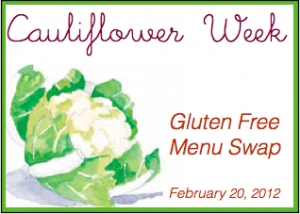 The Gluten Free Menu Swap is being hosted this week by Wendy of Celiacs in the House. She has picked cauliflower as the theme ingredient for the week. My family loves cauliflower, whether we eat it raw with a bit of dairy free ranch dip, roasted with olive oil and fresh cracked pepper or as a delicious cauliflower puree. The November 2011 Gluten and Dairy Free OAMM Menu also has a recipe for Turkey Shepherd’s Pie with Cauliflower Mash. Yum! How do you like to fix cauliflower for your family?